(CBS/KHOU) HOUSTON - An unidentified body was found in Montgomery County Sunday and family members believe it to be Amber Elkins, a 20-year-old mother from Humble who went missing a week ago. Texas Equusearch volunteers located the remains in a wooded around 3:30 p.m.
Tim Miller, the director of Equusearch, told CBS affiliate KHOU that they obtained information from the Sheriff's office that phone calls had bounced off nearby cell phone towers and they found the body within the perimeter. "This has been the hardest week of my life," Michael Elkins, the victim's father said at a candlelight vigil Sunday evening. He and the rest of the family believe the body found is their loved one, although authorities will not confirm the identity. The news comes a day 31-year-old James David Clark was charged with her murder. Some family and friends described Clark as Elkins' relatively new boyfriend, but her sister Ashley adamantly denies that claim, saying he was only someone her sister was trying to help. "She just wore her heart on her sleeve, she's like the rest of us," Ashley told KHOU. "I mean, if we've got dollars in our pocket and you need it, we'll give it to you." Investigators said Clark gave them no leads to find Elkins, but they reportedly had witnesses and enough physical evidence to point the finger at him. He was booked into the Harris County Jail around 10 a.m. Saturday. 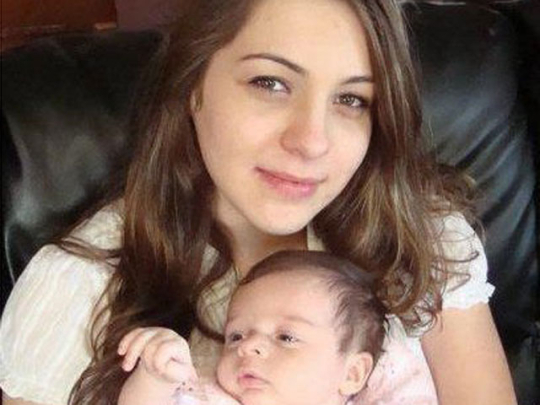 Elkins was the mother of a 9-month-old daughter named Ava Nicole. The baby is with her father, according to Elkins' mother. Clark, who has a lengthy criminal history and has been charged with assault and drug charges before, is expected to face a judge Monday morning.